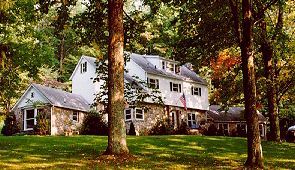 Tunnel Mountain Bed and Breakfast is a three story fieldstone home nestled on five wooded acres overlooking the Monongahela National Forest and the Cheat River. Four miles east of Elkins on old Route 33, we feature three guest rooms, each with a private bath, antique furnishings and woodwork, hand made comforters, air conditioning, a gift shop and a large living-dining area with fireplace. Close by are many out door activities - hiking, fishing, biking, hunting, canoeing, golf, tennis, horseback riding, skiing, (Canaan, Timberline, Snowshoe), excellent restaurants, three major festivals, Cass Scenic Railroad and the Tygart Flyer Train Excursion. Rates: Sensational views from all rooms, patio and grounds. Home made, sit-down breakfasts included in rates of $75 (double), $65 (single) plus tax. Phone reservations are suggested at which time a deposit (personal check) will be requested. Two day minimums on holidays; closed Christmas. No credit cards. Children over 12 welcome; no smoking in common areas. This and other Elkins Bed and Breakfast Inns can be found here in The Register.